This week, I spent part of it with a sixth grade class at the International School in the Bellevue School District. Together with their amazing teacher Cheryl, we ran a focus week for a group of 15 students. Students were allowed to pick from a myriad of activities as part of their pre-spring break choice week. This particular group had chosen to work with me on Minecraft Education Edition because of their love and passion for the game. In planning for the week, I wanted to provide them with an authentic opportunity to interact with not just me but other members of our team, learn a bit more about how features get developed into their beloved game, and design thinking process involved in making it all come to life. Students formed small groups and took on the challenge of pitching features they’d like to see in the Minecraft Education Edition. If you’d like to see how this week together, check out our OneNote here. You can also see students’ proposed ideas here. Needless to say, when students are given an opportunity to work together to solve a complex challenge, they will astound us with their creative prowess and empathy for users. I am so lucky to have met these students and some of them even helped me to work on my Minecart creations. Let me know if you’d like to use some of these resources to create your own design challenge day(s) with your students. I’d love to connect with you and help you do a similar activity with your students. I am returning from a week in Toronto with some of the most energetic, energizing, and thoughtful educators from around the world at the E2 conference. What struck me about the gathering was the sense global citizenship, the welcoming attitude of our Canadian hosts, and general sense of unity amongst all the attendees. I also noticed that all these educators who often didn’t speak a common language could immediately connect around wanting to improve their practice to serve their students better. Educators no matter where they are, no matter what they’re doing, they never forget their students. We know that our growth and relevance depends on our continued exploration of new ideas, new tools, and meeting new people. I loved meeting educators like Renato who is doing incredibly innovative things using Minecraft with his students. And Dean who is using Minecraft to teach his students about slope and rise/run, words I have not thought about in a long long time. It was also great to connect with the amazing Minecraft Mentors who were also present at the event. I missed so many of my educator friends while I was making new ones, so many educators around the world would benefit from a chance to see practice beyond their own classroom and their own focal point. It helps all of us to step outside of our day-to-day work to be exposed to new ways of being educators in the world. I can’t wait till next year, and I hope to see you there. If you’d like to check out my talk about Minecraft Education Edition during the livestream, you can find it here. Thank you to the organizers of this incredible event for all their hard work. A few years ago, I taught a class called “Storytelling” and it was my students in that class who taught me a great deal about game-based learning. I’d see them engaged in their video games or magic cards, and as a self-proclaimed non-gamer, I had much to learn from them. A great game combines the art of storytelling, fine arts, music, video production, and appropriate player engagement to create an immersive, memorable experience. Gamers are very much like readers: they like to explore, uncover, discover, and fully immerse themselves in the experience they’re willingly entering. As a book nerd and teacher of readers and writers, it took me a long time to realize my students were reading and writing in games in the same ways I wanted them to do with books. It took me a while to learn from them that games were another form of literacy they were unlocking for themselves. I began to reimagine my class and used the above principles to make learning more engaging and impactful for my students. Was I building in enough time for my students to practice? Were all of my students being appropriately challenged by the work in the course? How can I create learning activities that will make my students willing participants in them? Turns out, educators have a lot to learn from game designers and I was barely scratching the surface of this topic. Ultimately, using game-based learning tools like Minecraft in your classroom works because our students already inhabit this world and speak its language. It’s up to us to take their passion and leverage it toward powerful learning experiences. If you’d like to take the plunge with us, over the next few weeks Minecraft Education — in conjunction with Teaching Channel — will lead a webinar and multiple Facebook Live sessions to help you get started with your Minecraft: Education Edition journey. For now, feel free to peruse the various Minecraft resources on Minecraft: Education Edition, including lessons, tutorials, and mentors, and to start your free trial. Share your thoughts and leave us a comment about what you’d like to see included in our future webinars, Facebook Live sessions, and blog posts. Meenoo Rami, author of Thrive: 5 Ways to (Re)Invigorate Your Teaching, is a National Board certified teacher who taught English in Philadelphia for ten years at the Science Leadership Academy and other public schools in the city. The founder of #engchat, an international Twitter chat for English teachers, Meenoo has also been a teacher-consultant for the Philadelphia Writing Project and an educational consultant with The Educator Collaborative. She is also an instructor at Arcadia University’s Connected Learning Certificate Program. Meenoo has also served as a teaching fellow with the Bill and Melinda Gates Foundation, where she led the portfolio to help teachers refine their practice through collaboration. 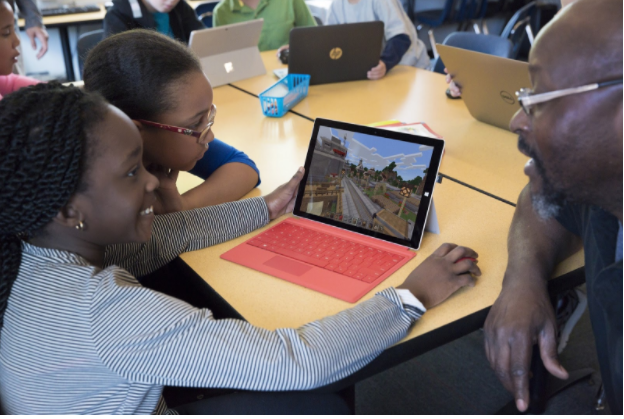 Currently, Meenoo works as Manager for Minecraft Education at Microsoft, where she helps educators and districts reimagine game-based learning for classroom practice. Connect with Meenoo on Twitter: @MeenooRami. I had the honor of getting to know Dr. Amy Stornaiuolo when she conducted some action research in my classroom. For many Fridays, she’d watch me strive, struggle, and at times reach my students at SLA and then afterwards we’d talk at length about her observations, her questions, and reflections on the collective work of my classroom. She honored students’ thoughts and opinions and interviewed them privately about their experience in my classroom. I learned so much from those Friday afternoon conversations and have continued to learn from her. Please take a moment to check out a new project she is launching for educators and share your thoughts on it if you check it out. I am excited to share with educators the Write4Change community. After finishing some pilot work, we just moved to a new platform and are just about to launch into a new activity cycle, which will bring together teachers and their students in more than 7 countries (and counting). We are working with the National Writing Project and hope to have lots of NWP folks joining in the next year! Write4Change is a global online community for adolescent writers (ages 13-19) to share their writing with others, collaborate with global peers interested in using writing to effect change, and learn from and with one another. Teachers sponsor their group of students, who engage in writing projects that are oriented to taking some form of action. Some of our educators teach history, social studies, or civics classes and are interested in youth developing as civic actors on a global scale. Other educators teach writing, either informally in libraries or camps or formally in English classrooms, and are interested in connecting their writers to broader audiences and purposes for writing. And still others are media, art, or enrichment teachers interested in issues of social justice, equity, and artistic voice. As you might imagine, with all of these different partners, we think about writing and change very broadly. Change can involve more individual and local change (as young people think about themselves, their schools, and their neighborhoods) or broader social change (e.g., advocating for girls’ education). Writing may include traditional textual forms (essays, narratives, poems) or more arts and media oriented textual forms (digital stories, movies, films, image, music, etc.). The tools in our community will help writers with these different forms. Teachers are welcome to use the provided curriculum, design new curriculum to share with others, or use or adapt their existing curriculum on the W4C platform. We are very open to teachers customizing the space and community to suit their needs. Are you coming to EduCon? If you’ve not attended EduCon before, you’re missing out. If you’ve been here before, I don’t need to explain the magic of Educon to you. I invite you and your colleagues to EduCon, a conference hosted by my former school, Science Leadership Academy, in Philadelphia. It would be lovely to see you here and a treat to spread the conversations among the wonderful folks that you work with. This year’s conference takes place the weekend of January 27-29, 2017 at our school. It’s not a typical conference: there are no vendors present, and the breakout sessions are conversations, not presentations. Every year I am reminded of the incredible communities I am privileged to be a part of — both the SLA community and the EduCon communtiy — and feel so proud of the work we do in our conversations about education. I’ve written about our conference many times on my blog; this reflection is one of my favorites. I hope you can be a part of our community at this year’s EduCon. Registration is available on our website, and proposals for conversations are being accepted through November 1. Your voice would be a valuable addition to the mix. I’d love to hear your reflections or tips for new attendees if you’d like to share in the comments. Thanks! In a few weeks, I will be leaving the Bill & Melinda Gates Foundation to join the incredible team at Minecraft Education. I’m grateful to the Foundation for introducing me to so many inspirational educators and ideas, and I’ll always be a champion of the Foundation’s commitment to equity, optimism, and students. In my new role at Minecraft, I will be joining a team that helps students unlock their own potential for deep learning. My students at Science Leadership Academy first helped me to learn about the potential for using gameplay in storytelling, problem-solving, and creative thinking. I am bringing that powerful experience with me, and I am excited about the ways in which Minecraft’s creative and collaborative platform can put students at the center of learning. If you’d like to learn more about Minecraft Education, check out this inspiring video that shows what Minecraft can look like in education and this portrait of a school district that is using Minecraft to transform its work with students. You can even dive in and start experimenting with Minecraft Education right now right here. Thank you for your support and for the work you do each day that benefits kids. I’m grateful to learn with you, and I hope you’ll continue to follow my journey as I embark on this new adventure. While candidates and media concentrate on issues that matter to voters in this election season, teachers and students in our nation’s schools will be concentrating on issues that matter to the next generation of voters. How can they have a voice? 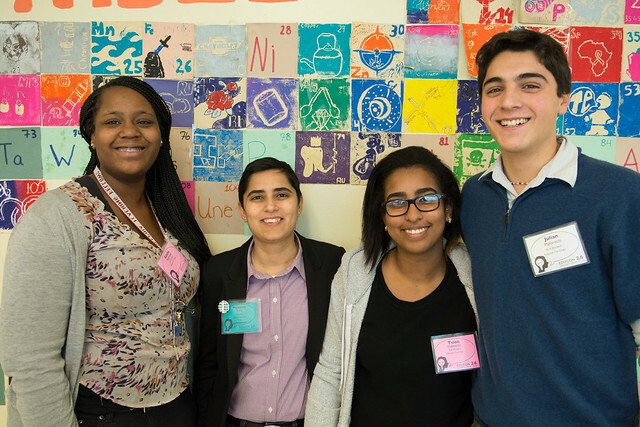 How can we support the mission of schools to engage youth as productive and active citizens? Letters to the Next President 2.0 (L2P 2.0) is an initiative that empowers young people (13–18) to voice their opinions and ideas on the issues that matter to them in the 2016 presidential election. The focal point of the program is a massive, open online publishing platform where any educator or youth mentor give their students a safe place to voice their opinions about key election issues that they believe the next president whomever he or she may be—needs to address. The site also offers a dynamic repository of resources, ideas, how-to’s, and other helpful information for educators to make the L2P 2.0 project engaging and powerful for their students. as many youth as possible so that their voices can be heard. Sign up for resources and opportunities. Share book reviews and ratings with Meenoo, and even join a book club on Goodreads.